Annual Conference 2012, like most of the 145 previous gatherings, was a flurry of activity. For three-plus days the members and guests of the Annual Conference gathered for inspiring, meaningful and soulful worship, fascinating and thought-provoking teachings and to conduct the business of the conference. And, as if that wasn’t enough to keep the minds, hearts and souls of the conference focused on our mission of making disciples of Jesus Christ for the transformation of the world, there were also myriad opportunities to acknowledge and celebrate the ministries and missions of the conference. The Harry Denman Evangelism Award – This award recognizes those members of the conference, clergy and laity alike, whose life and ministry exemplifies the teaching of Christ and the Great Commission. 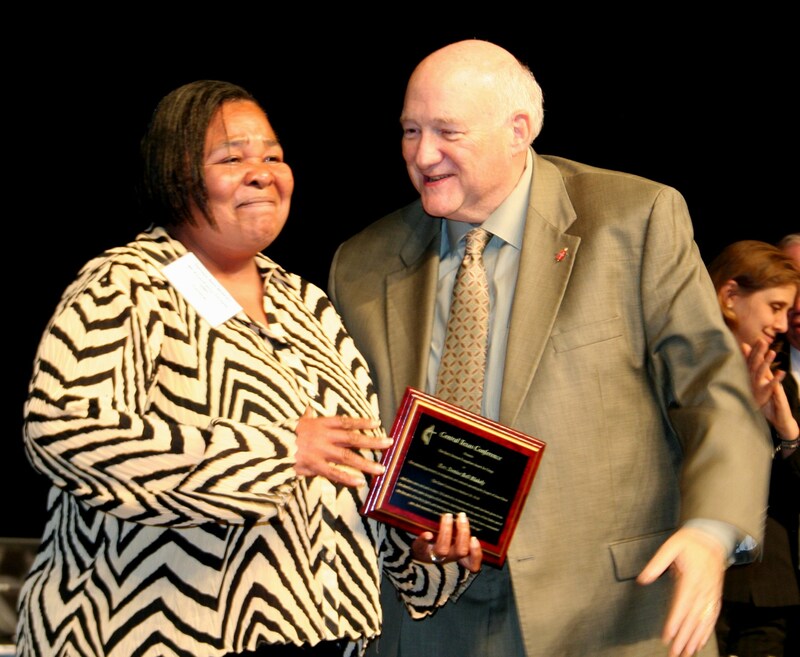 This year’s clergy award was presented to Denise Bell-Blakely, pastor, Mt. Zion/Perry Chapel UMC, and the laity award went to Seth William Locke, youth member, DeLeon First UMC. “Seth in no one to just talk about his faith, he lives it.” These were just a few of the words read by Rev. 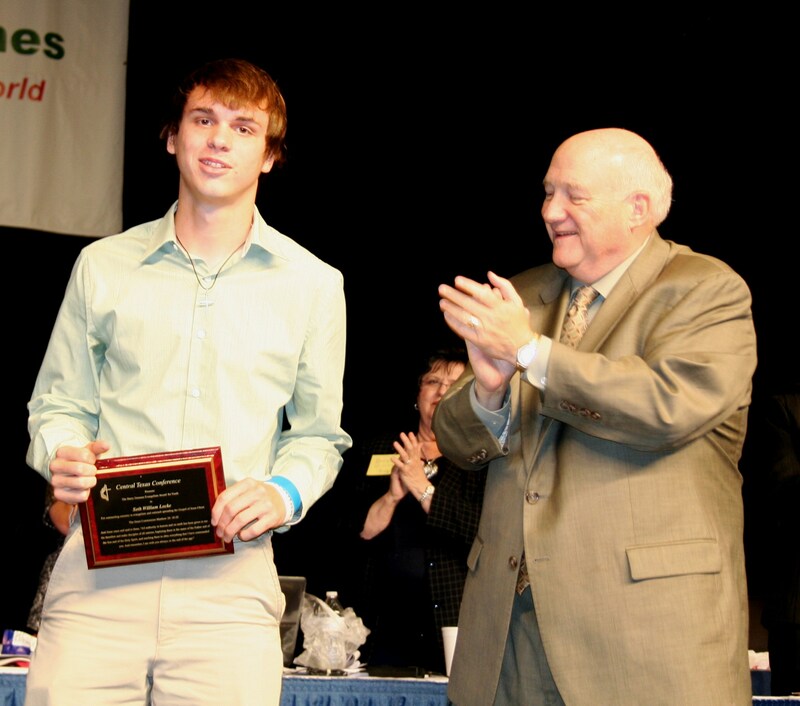 Lindley as he introduced Seth Locke [photo right after receiving the award from Bishop Lowry] as the laity recipient of the Denman Award. “Seth is a proven leader and active in his community,” Gary continued. ]Seth’s young but impressive resume includes working on the Community Rehab Team – a joint project between Comanche and DeLeon UMCs; National Honor Society treasurer; Theatre Club vice-president; letterman in football and track; and award-winning actor in UIL One-Act Play competitions. The Conference Merit Award – The Merit Award is conferred on a student that is moving on to a United Methodist affiliated school. 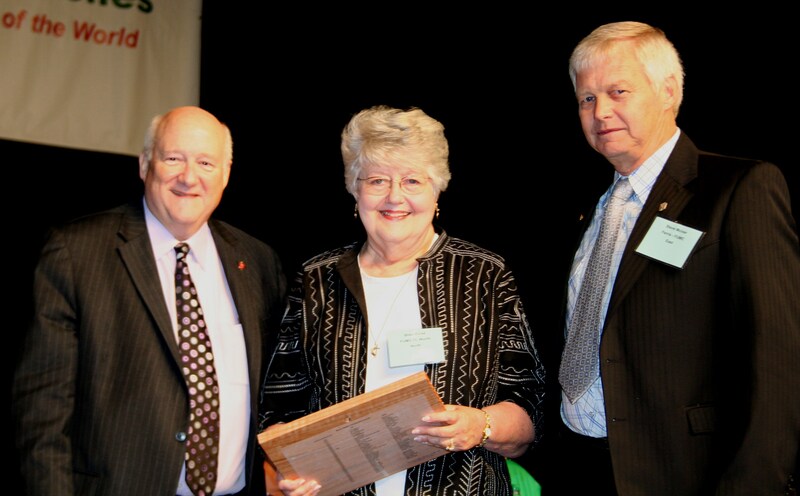 Forrest Stanley-Stevens of First Stephenville UMC was the 2012 Merit Award winner. 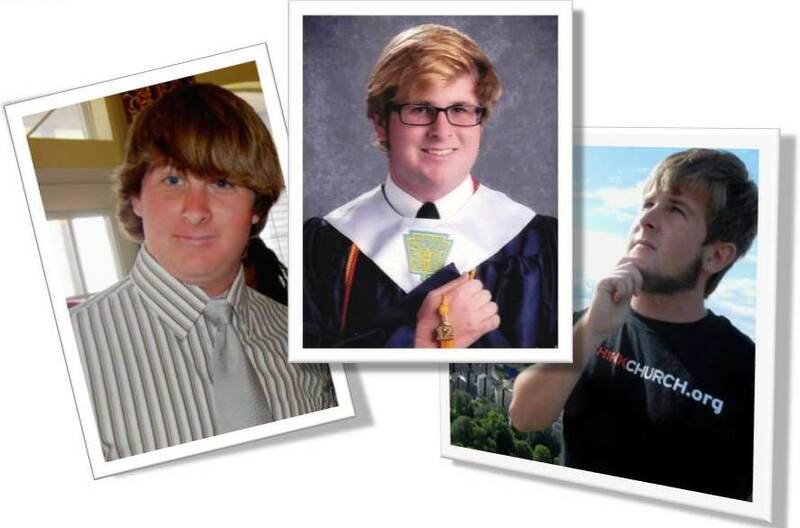 Forrest [photos to the right] is a graduate of Stephenville High School where he was drum major and band president. He plays the clarinet and saxophone. Forrest was a youth delegate to Annual Conference for the past two years, serves on the conference Student Leadership team and was president of the Brownwood District Youth. He has also won UIL writing awards and band honors. Forrest plans to attend Southwestern University in Georgetown this autumn. 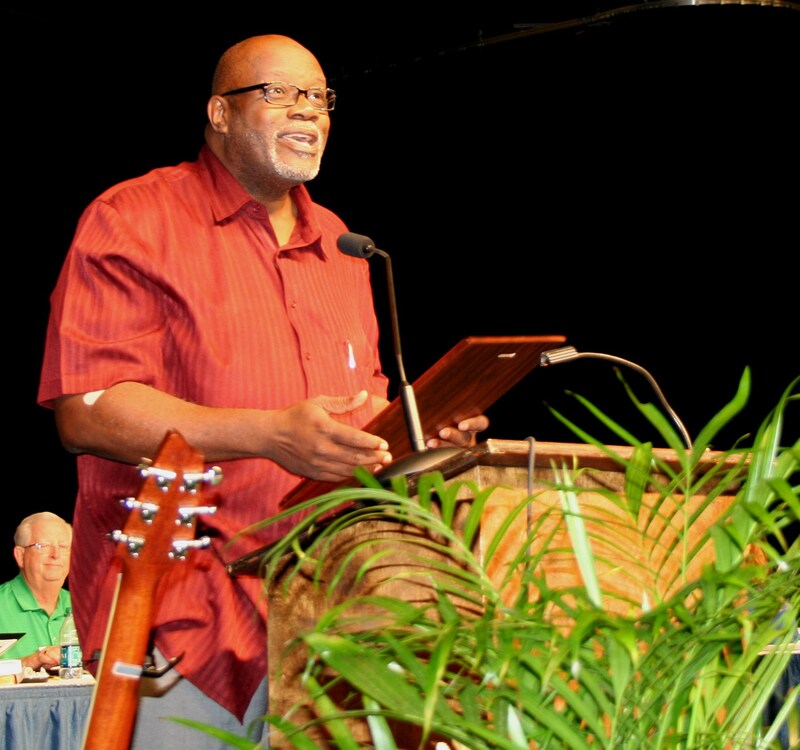 Bishop’s Excellence in Preaching Award – The third annual Bishop’s Excellence in Preaching Award was presented to Rev. Quinton J. Gibson, senior pastor, St. James UMC, Temple, Texas. 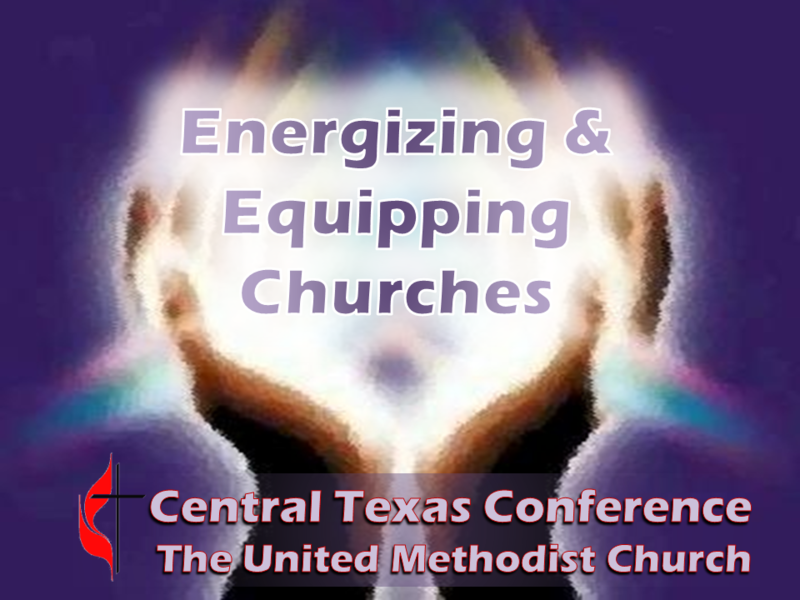 Board of Ordained Ministry Scholarships – The Board of Ordained Ministry (BOM) announced eight scholarship winners during Annual Conference 2012. John W. Elliott, Sr. Memorial – Fred Bates, Jr. Please join us in congratulating all those named above and thanking them for their outstanding service and dedication to our mission of making disciples of Jesus Christ.